Our second Free Training for Life competition blazed across the world with over 15,000 entries from 24 countries. The prize: unlimited free access to our entire portfolio of training courses, for life. And now the wait is finally over. Who succeeded in claiming the ultimate prize of unlimited free training – who has become the ultimate cert-collector? 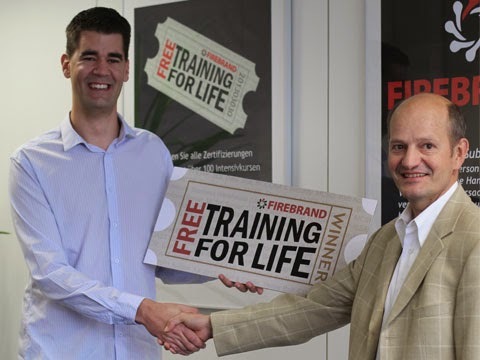 Firebrand is delighted to announce that Mr Mario Henkel is this year’s winner of Free Training For Life. Starting today, Mario Henkel will receive access to a lifetime’s worth of free training courses and exams from Firebrand. He’ll be able to choose from 200+ IT, security and project management courses. Mario has already decided to take EC-Councils Certified Ethical Hacker (CEH) course as his first choice of certification. He’ll learn to think like a hacker and apply this to fend off attacks on his organisations network and systems. Plus, Mario’s prize means he won’t have to pay for any training fees, exam fees, course books, food and accommodation. Not to mention, Mario can also undertake his training in any of Firebrand’s training centres across Europe. Mario now joins previous winner, Joseph Guthrie, as the two winners of Firebrand’s life-changing and career augmenting competition. Truly, this is one exclusive club. To hear Mario talking about his prize you can head to the FTFL page and watch his winners video. 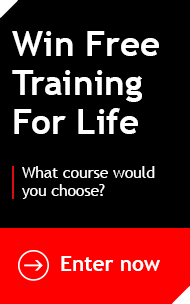 We’d like to thank all of the 15,000 entrants to our second Free Training For Life competition.